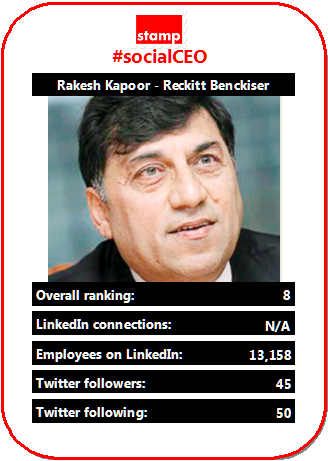 Continuing our countdown of the top ten #socialCEOs (based our October 2013 report data) at number 8 we find the main man at consumer goods company Reckitt Benckiser, Rakesh Kapoor. Differentiating the bottom four of the top ten has been something of a challenge as there is little between them (and it’s mostly their companies’ social presence that gets them here anyway. The number of people Rakesh follows (as an indication of a two-way rather than just broadcast approach to social networks) is what puts him in ahead of Rupert Soames and Carolyn McCall. He’s not got a LinkedIn account for the thirteen thousand RB employees to connect with him, though. Reckitt Benckiser have a reasonably mature social presence as a corporate, with Twitter and managed LinkedIn profiles.